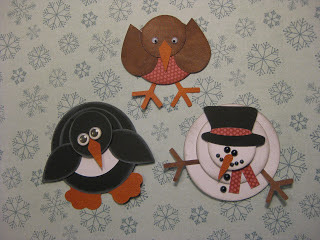 Seamless Piecing: Fat Penquin - Something to Break the Ice. 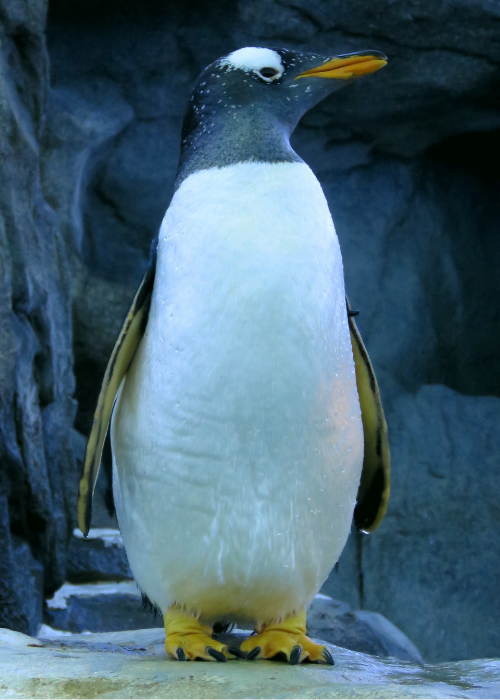 Fat Penquin - Something to Break the Ice. Here's something you may not know about me: Quilting/sewing wasn't my first crafty love. In the span of my adult life I've enjoyed many types of crafts. Crocheting, needlepoint, cross-stitch, punch needle, painting, woodcraft, embroidery and more. My mother made sure all 6 of her children knew how to embroider before we went to school. I suppose when you have 5 preschoolers at once you gotta keep them busy somehow. Fat Penguin - Something to break the ice. My sister, Gail, is a drive-by crafter. She'll make one fabulous piece and never return to the craft. She has made a hanging glass table, an expanding Mary Poppins bag, and a beautiful knitted cardigan, to name a few. But she only made one. In fairness, she crocheted slippers for all her family for Christmas one year. I didn't become obsessed with an individual craft until I met scrapbooking. For years, I was a scrapbooking maniac! I spent thousands of hours... and thousands of dollars... on scrapbooking. When I wasn't cutting and pasting, I was shopping. I became a scrapbook store philanthropist. The photos I had available to add to pages were from BDE (Before the Digital Era). You remember those photos... everyone was posed, looking into the sun. If the photographer stood back far enough to get everyone in the pic it looked like they were standing in the next city. Faces from candid shots were small enough to put in a locket, except you couldn't tell who they were. I came to feel that if I worked hard to make a page look perfect, why would I want to ruin it by adding an ugly photo. I have albums full of beautiful pages with no pics. When I realized it was the cutting and pasting I enjoyed, not the photos, I changed my hobby to card making. I did that for a while until I had enough cards for everyone in the universe to give a card to every other person in the universe. That's only a slight exaggeration. My last spree was at an outlet clearance store where I spent $200. on supplies to make a baby book for my first grandson. He'll be 5 years old soon and all those supplies are still in the bags they came home in. Now that I have 4 grandsons, and 2 grand daughters, I'm no longer interested in paper crafting. But, if I change my mind I won't have to purchase anything for all the books I care to make. EVER. I even had a scrapbooking blog... “snail*S*pace – finding joy along the slime trail”. What?!... it was a great blog! It's still up so I can go read it occasionally. It was during the snail*S*pace era that I emigrated/defected from paper to fabric. That may seem like a leap, but they both require cutting and reassembly, so they are not that dissimilar. But in quilting you don't spoil your work with poor photography from the 80's. 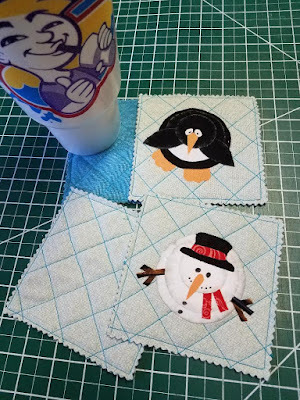 This month's FREE project is a rerun from that blog. I even recycled the title. In a post dated Sept 2012, I said if I made the penguin again I'd make him less fat and tuck his feet in farther. Now, 6 years later, I think he's perfect. This time, however, we'll make him, and his snowman friend, from fabric. Fusible applique will streamline the project. There's nothing finer than hot chocolate in front of a warm fire... and nothing worse than moisture rings on your furniture! Coasters make great little gifts during snugglin' season. Should they be called coco-coasters when chocolate is involved? I'll let you decide while we move along to the project. Sorry for the funky angle. I was trying to reduce glare. 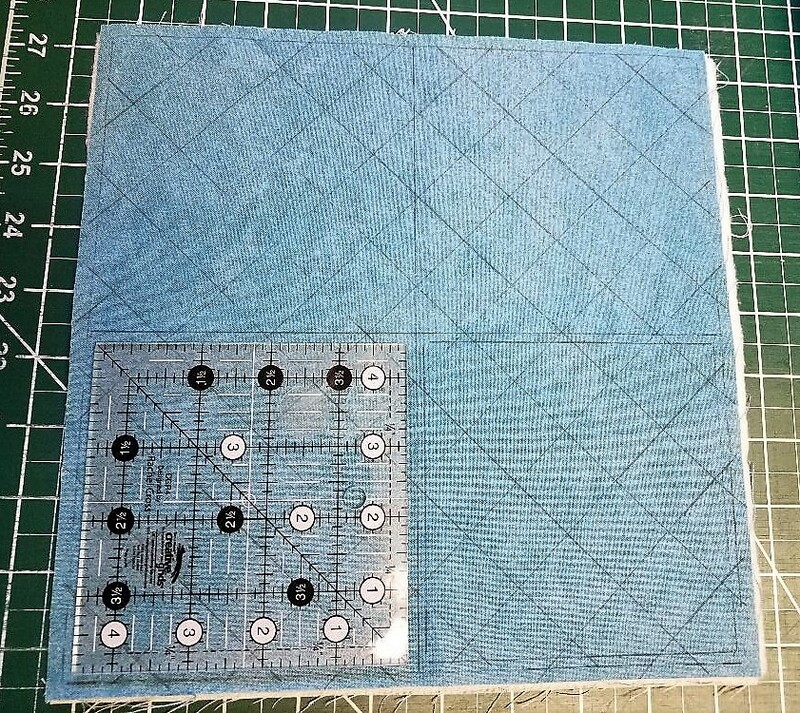 Using the backing fabric, gently crease the square in half both directions to create 4 - 5"cells. 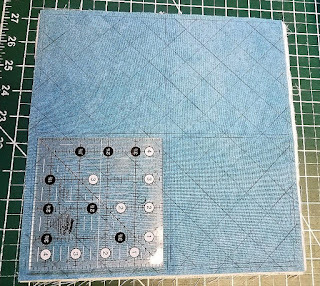 On the RIGHT side of the backing fabric, use the 4 1/2” ruler to draw a square in each cell. Center the ruler so there equal 1/4" margins on all sides within the cell. Use the straight ruler to draw diagonal lines across the whole 10” square. Diagonal lines should be about 1” apart and should avoid intersecting the corners of the 4 1/2” squares. Make a quilt sandwich by laying the top face down, then the batting, then the backing with markings face up. Baste with spray or pins. I recommend spray. Make sure the edges are stable. 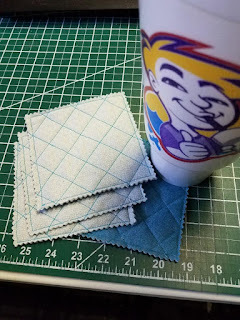 Sew the diagonal lines first, beginning in the center and working out to the edges. Work carefully so you don't create any puckers. When all the diagonal lines are sewn, sew along the lines of the 4 ½” squares. Use pinking shears, cut out the 4 1/2” squares leaving a 1/4” margin on all sides. Your coasters are ready to gift or decorate. 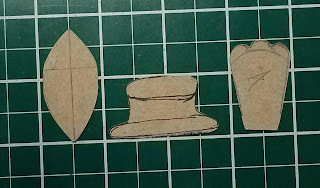 Begin by drawing all the parts onto the paper backing of the fusible. Cluster the parts together that will be cut from the same fabric, ie: black bits, white bits, orange bits, red bits, brown bits. If you are making a penguin and a snowman, or multiples, draw all the parts onto the fusible at the same time. 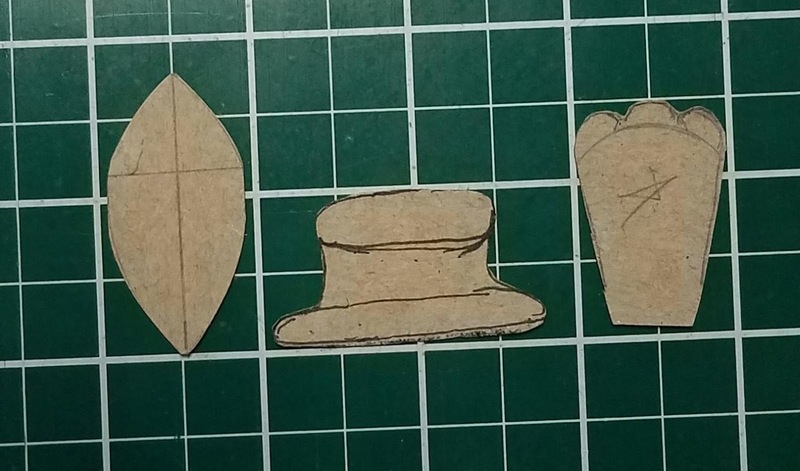 It's easier to work with larger bits at a time, especially when working with very small parts like noses. NOTE: One day I'll learn to create a printable PDF with the shapes you'll need. Sadly, today is not that day. Best I can do is a close up of the templates I made. 2 black wings in a leaf shape 1 3/4” long x 7/8” wide at the widest part. Reverse 1 for symmetry. 1 orange nose in an elongated kite shape about 1” long and 3/8” at the wide place. 2 eyes: cut freehand, small ovals, about 3/8" x 1/4"
1 orange set of feet. Cut 1 foot template. Draw an arc indicating where the feet will tuck under the body. Trace one foot in place, trace the other foot, template reversed, in place. Connect them when you cut them out so you don't have to figure out the angle again. Here's a PDF of Donald Duck feet if that's easier. They only need to be about 1 ½” long. 1 red scarf cut from scraps. Cut a rectangle ¼” x 2 1/2”. Snip it into lengths you like. Noses- don't bother with a template for these. 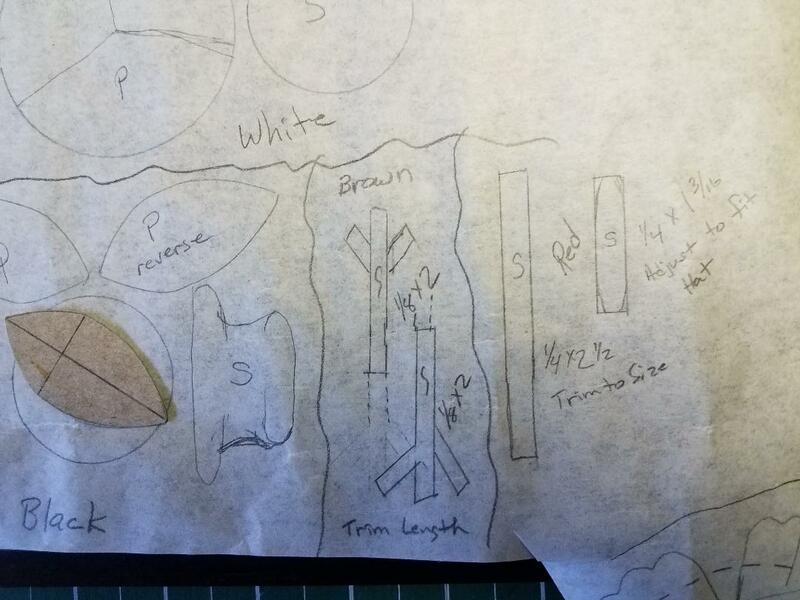 Just cut fused fabric into rectangles as indicated. Trim away what you don't need. Wings – Cut out the rectangle. Mark the center lengthwise and mark the widest point at about 5/8”. Draw curved lines from tip to tip with the widest point at the mark. Hat- Should finish 1” tall. 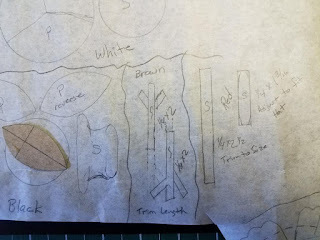 draw a 1 1/8” long oval at the top and a 1 3/4” long oval below for the brim. Connect the sides with a curved line. It doesn't have to be perfect, it's a snowman. Snowman arms – You can make these however you want. Free handed branches would be awesome. I drew parallel lines 3/8” apart using a straight ruler. Dimension is not as important as looking proportional. Cut the fusible interfacing into sections by color and fuse according to manufacturer directions to the BACK of your fabric. Don't remove the paper backing until after cutting out the pieces. Cut out the pieces along drawn lines, sorting as you go. If you plan to add a painted shadow on your edges, do that now. Use a dry brush or sponge with the smallest possible amount of light gray paint. Brush gently along the very edge. I thought I was using barely any paint but I had do go back later and add white paint to tone down my snowman so it didn't look like he was covered in soot. Use the same light gray on the penguin and the snowman. Penguin – dust small circle, wings, half of middle circle. Play with the parts until you know how you want them to be arranged. They are designed to look like they are looking up into the sky. Do You Want to Build a Snowman? … and a Penguin? Fusing is best done with a hot dry iron. Read the fusing directions. I'm using heat and bond lite which fuses very quickly. I won't leave my iron on the project for more than a second. The goal is to melt the glue, not to dry it out. If it dries it won't stick, and that's no bueno. Press with a Down-Up motion. No sliding of the iron. You don't want your parts to shift. We'll fuse these in layers, building from the base up. Take these to the pressing board and do them two at a time. With the black marker draw Penguin's pupils and Snowman's eyes, mouth and buttons. And we're done! See what I mean about taking longer to explain than to make? Easy! I hope you love them like I do. Decorated or not! The next FREE pattern will be released on Boxing Day. (That's the day after Christmas for us American types.) If you know what Boxing day is will you please let us know in the comments? I have no idea. This time of year is crazy busy for most of us so small and quick projects are appreciated. But don't get used to it. Spoiler alert! Next month's hanging quilt is epic! If you have questions or comments about the Fat Penguin pattern, please leave them in the comments. Or you can email me directly. I'd love it if you'll post photos of your projects on our Facebook Page! And... I'm off to make 11 more sets of coasters. Happy Sewing everyone!